Awareness on waste management should start from schools at a young age. 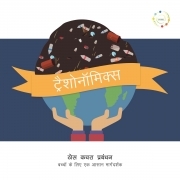 Hence, through SWMRT's research and learnings, we are proud to present 'Trashonomics' - a simple guide for Solid Waste Management that can be included as a supplemental booklet to the Environmental Science subject or Value Added subject for middle school (5th, 6th, 7th or 8th). Schools ordering 30 copies or more can avail a discount by writing to info@pothi.com or 2bins1bag@gmail.com. Solid Waste Management Round Table, Bengaluru (www.SWMRT.com) is a voluntary group of individuals, bringing their expertise as SWM practitioners , waste management solution & service providers, representatives of waste-pickers & waste workers, individual activists working collectively towards the cause of sustainable decentralised waste management including policy changes in Bangalore, since 2009.